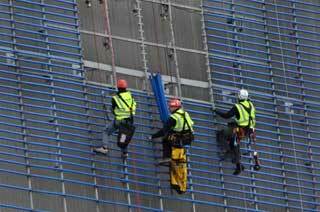 Our employees are qualified IRATA (Industrial Rope Access Trade Association). It is an internationally recognized training the best possible qualifications for work at height and rescue. We provide services since 1997. We are an active member of the Czech Mountaineering Association. Throughout we specialize in the execution of contracts located in harsh environments - especially at heights over open depth and extreme conditions. Work performed depending on the complexity of the contract using climbing techniques and Speleological, suspended platforms, scaffolding, ladders and mobile assembly platform. All work carried out by a team of experienced employees both professionally and movement at heights.